The top generals from Turkey, the United States and Russia met Tuesday in Turkey to discuss mutual suspicions over northern Syria military operations, as Russia’s military announced a two-week long cease-fire between rebels and the government in the suburbs of the Syrian capital, Damascus. Government forces have intensified their siege against the civilians and rebels there since February in an effort to secure a surrender that would see part of the population sent to exile. The U.N. has denounced other such arrangements as “forced displacement” and war crimes. 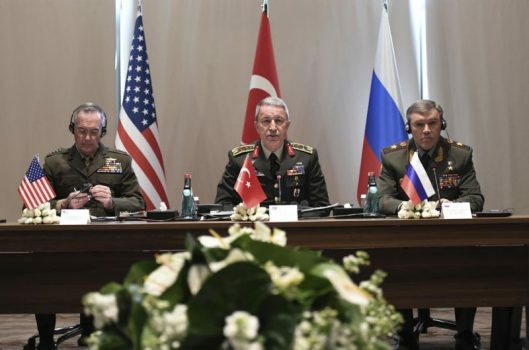 The surprise meeting between Turkey’s Gen. Hulusi Akar, Marine Corps Gen. Joseph Dunford, the chairman of the U.S. Joint Chiefs of Staff, and Gen. Valery Gerasimov, the chief of the Russian General Staff, was called to address reciprocal mistrust between Turkish-backed Syrian opposition forces, U.S.-backed Kurdish forces, and Russian-allied Syrian government forces, fighting their way toward the Islamic State group’s de facto capital, Raqqa. “We can clear Manbij together, then we can clear Raqqa together,” he said. On Monday, SDF fighters blocked the main road linking Raqqa with the eastern of Deir el-Zour, which is split between IS and the Syrian government. The SDF is now stationed eight kilometers (five miles) north of Raqqa. Elsewhere in northern Syria, government forces and their allies marched closer to a main water pumping station controlled by IS in Aleppo province, Syria’s military and an activist group said. The government-controlled Syrian Central Military Media said troops are now just miles from the station, which supplies the northern city of Aleppo, Syria’s largest, with water. The advance is part of a dayslong government offensive against IS backed by Russian airstrikes. Taking the water station would ease Aleppo’s water shortage. In the center of the country, Syrian troops captured the Jazal oil field from the extremists after days of fighting, state TV said, quoting an unnamed military official. The TV said military experts are dismantling explosives left behind while firefighters are working on extinguishing one of the wells that was torched by the extremists.